The latest iteration of Konamis football game is fine, but inorganic, stolid, and a little dull. Pick FIFA over this on PC. This latest version of Pro Evolution Soccer feels oddly preordained. Where a match played on its great rival FIFA is at the whim of an object as bouncy and round as, well, a football, a match on PES 2013 feels like you're performing actions set in the stars by footballing gods. Passes ping between players with unerring accuracy. Real football sees mis-hit shots flying off into space, or passes bouncing off clumsy legs to run free until they're collected. Every one of PES's booted balls seems to nestle in the instep of a player as if they were feet-seeking missiles. They're all accompanied by a soft little pop, the kind of noise a corner shop penny floater makes when hit perfectly. Konami's vision of football feels divorced from reality in other ways. Sprint with the ball and it'll ride back against your runner's feet, relentless backspin killing almost all pace. Deliver an acceptable forward pass and chances are the eventual shot will be strangely scooped, too high and soft to trouble the keeper. PES determines the power of its kicks by the amount of time the button is held – I say 'button' because even the purest of PC purists should be using a pad – but the opportunity to accurately hit even a simple shot is seemingly measured in picoseconds. Tackling is similarly unsatisfying: players have a tendency to sashay past each other, not through individual foot-skill, but thanks to a strange ethereality that'll suddenly place both the ball and its attached man on the other side of a defender. Great when it's in your favour, infuriating when you were sure you had told your defender to slide just before that shot got away. These complaints sound damning – they're not. PES responds best to players who've had hours honing their control with some of its more esoteric sub-systems, like the close control options that allow skilled ballsmiths to take it around other players, and it can be smooth and responsive enough to allow for beautiful, creative passages of play. But they're few and far between compared with the Barcelona-shirted FIFA elephant in the room. That game produces several moments of panic and elation a half; PES is lucky if it can bang out one in a game. 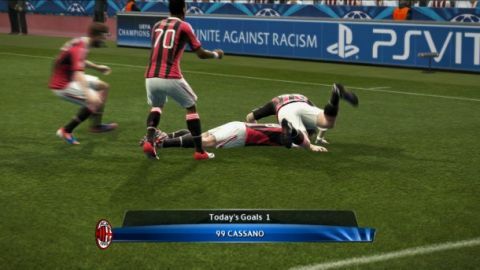 FIFA also has the edge in performance: PES 2013 makes little use of the PC's grunt, chugging out a muddy, bleak vision. Matches are littered with replays by default, demanding a visible loading time and two instances of the game's logo per video.